It’s taking me a little bit of time to learn WordPress, the content managing software (as they call it) which I am now using for the landing page of my website. I want to be able to create Pages of lasting content, like in my old website, as opposed to Posts like this one. On Thursday I should have some content ready for the first page that is now listed in the sidebar on the right. Click here to see what it looks like now. 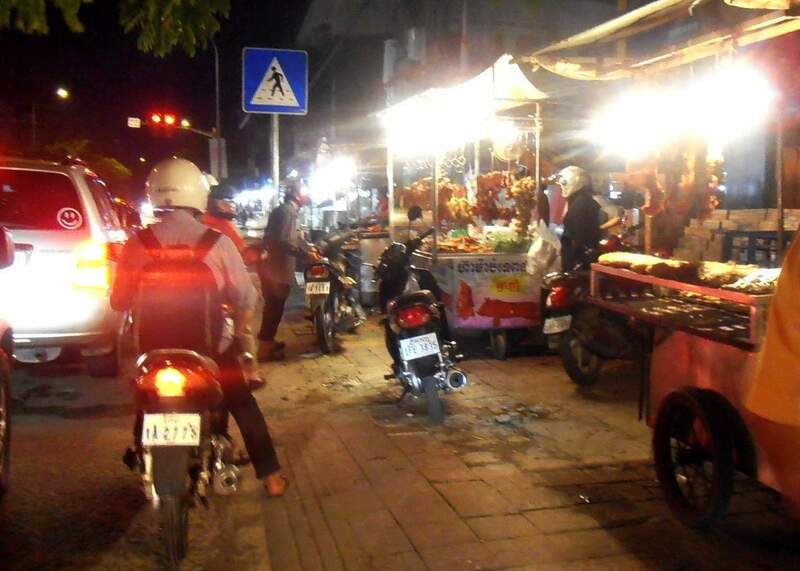 The trip to the US started Monday evening, 10 October, with a motorcycle taxi ride to the airport at supper time. The roads at that time are (1) jammed with traffic and (2) full of food vendors like these stalls selling roasted chickens, ducks, and fish. It’s 10:48 PM Tuesday night in New York and I just arrived at Maryknoll. Follow this trip here starting tomorrow. One of the givens in translation work in Cambodia or in producing documents in both Khmer and English is that the Khmer document is always going to be much longer than the English. 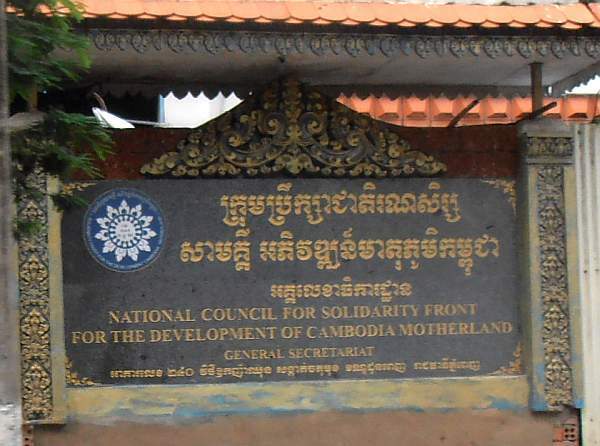 That makes this sign outside the National Council for Solidarity Front for the Development of Cambodia Motherland a bit unusual because the Khmer title appears shorter than the English version. Would anyone like to venture a guess what the NCSFDCM actually does? I haven’t a clue. Monday evening I catch a 9:30 PM flight from Phnom Penh to Bangkok and then at 1:30 AM I fly from Bangkok to Shanghai on my way to the United States. I have a seven-hour layover in Shanghai (that’s LONG but it was $700 cheaper than the alternative!) and then fly from there non-stop to Newark, arriving Tuesday night at 6:30 PM there. I’ll be at Maryknoll, New York the rest of the week for a board meeting of the Maryknoll Lay Missioners. Then on Saturday night I’ll fly to Louisville, Kentucky for a family reunion. See the STOP sign on the corner, behind the two pickup trucks? It’s brand new–and a total waste. I have seen maybe twenty STOP signs in the city and all of them are old and TOTALLY IGNORED. 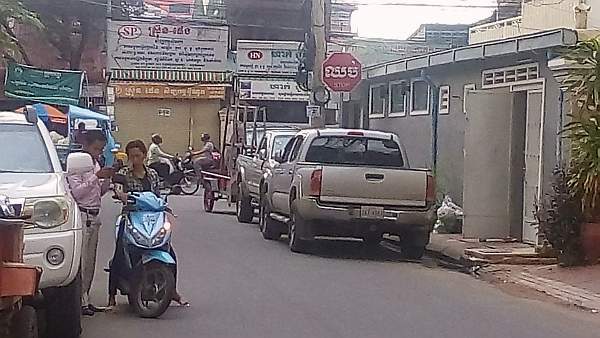 I believe it is the absolute truth that there is not one driver in Cambodia that has ever stopped for a STOP sign in Cambodia. This is the only new sign I have seen. The others all seem to be 20-30+ years old. Why they erected this one and why they chose the corner of our dinky little street, I have no idea. ….The Kingdom of Wonder. The dealer sticker on this Toyota says it came from Sierra Toyota in Sierra Vista, Arizona. 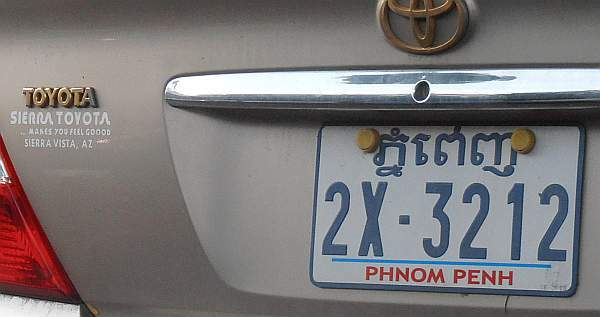 The license plate says it’s now registered and on the streets of Phnom Penh, Cambodia. The vast majority of the cars sold here are used cars from the United States. I would love to know the circuitous route by which a car gets from Arizona to Cambodia. 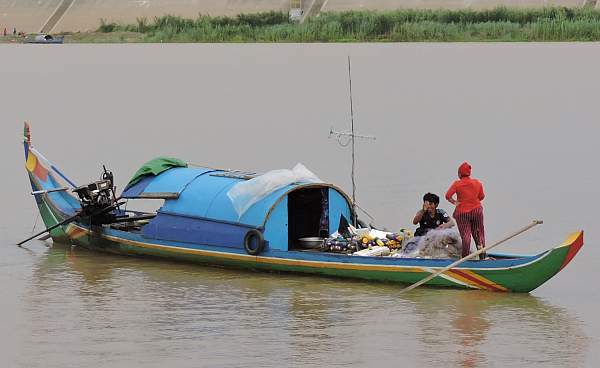 This is a fishing boat belong to a Vietnamese family who have the Mekong River in Phnom Penh as their fishing grounds. (I always hope the fish I eat are NOT caught in the river here since Phnom Penh has no sewage treatment.) This boat is also their home. Note the mast with a TV antenna on it. These people are essentially stateless and become the scapegoats for everything that the Cambodian government screws up. 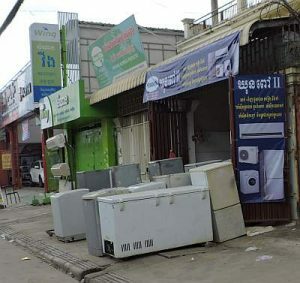 These are secondhand washing machines and freezers and air conditioners for sale on a sidewalk in Tuol Kork. The appliances may be used but having secondhand units for sale is a new development in Cambodia. Previously such appliances were barely available, and the rich families who could afford them held on to them. Now there has been enough development and rising incomes that more and more people can afford such appliances and a secondhand market has emerged. Cambodia has a real problem with holidays. First of all, there are 25 public holidays (the U.S. has 11) so more than a month of work days is lost. Then whenever a public holiday falls on a Saturday, the following Monday is given off, too. (That happened October 3rd because the Pchum Ben holiday was Friday, Saturday, and Sunday). Besides all the time off and lost productivity, the trash piles up as seen above. Households here do not use garbage cans or dumpsters. 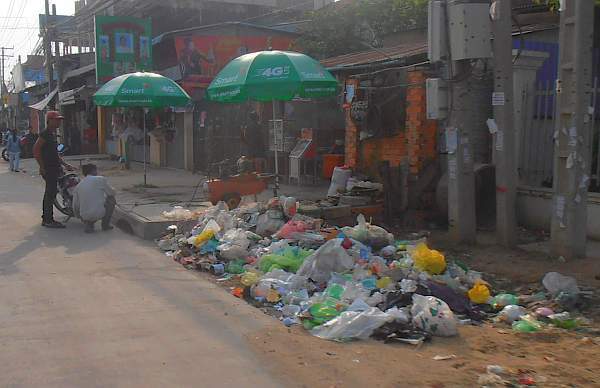 Everything is put in plastic bags and left on the street. When there is a long holiday, the piles get rather large. The man squatting in the picture is putting air in a motorcycle tire. His “gas station” consists of the orange air compressor and a bucket of water and a patch kit for repairing flat tires. Today when I had mass for the Salesian Sisters at their Teuk Thla community, I was surprised to see there Mabel Chan who was formerly a Maryknoll Lay Missioner in Tanzania. Mabel has now committed to one year of service as a volunteer at the sisters’ vocational school.